Installing one of the cheaper aftermarket programmable engine management systems into a grey market Japanese car is pretty common. The fact that the imports provide greater bang for the buck means it's more likely that they'll be modified (or arrive already boasting a full set of mechanical upgrade bits), while the fact that the Japanese factory management is tuned for higher octane fuel than is available locally also makes a change more likely. 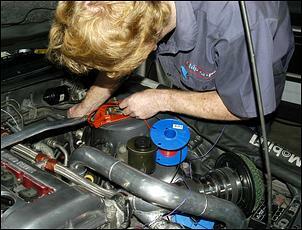 But what's involved in an aftermarket engine management install? Especially when - as is most often the case these days - the new system is 'piggy-backed' onto the original? We spent a day at ChipTorque's workshop and found out. 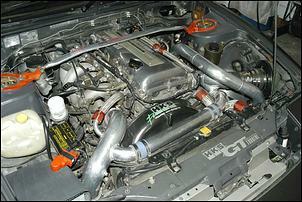 The car was a Nissan 180SX, owned by Jamie Wilson and equipped with the SR20DET engine. It arrived from Japan modified with a ball-bearing turbo (thought to be a GT-25), 540cc injectors, front-mount intercooler, larger Z32 airflow meter, pod filter and exhaust system. So why the need for new management? Stef Graf of ChipTorque explains. "The car had an F-CON HKS computer fitted originally, and between Japan and here it was removed. The direct plug-in harness was nowhere to be found - so we had an F-CON computer with no real physical way to fit it. Plus you don't get software for it, so we can't tune it. We had to turn the boost down to 14-15 pounds [for the 'before' dyno run] because it wanted to ping and it was a little bit leaner than we'd like. "Jamie is interested in going drifting and also drag racing. We probably could have done it with a chip, but since he is interested in going further [with modifications], once we go above 540-550cc injectors it's just too hard to get it nice with a chip." The ECU being installed was the MicroTech LT-8. Although MicroTech units - especially older ones - are not much liked by many workshops, Mathew Spry of ChipTorque is cautiously positive. "MicroTech is providing a computer for a price and you are getting what you pay for. 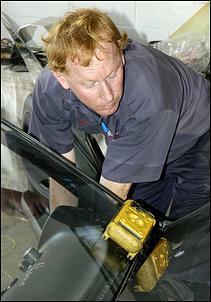 MicroTech is for the budget end of the market where people are prepared to make compromises on their cars. They're usually younger people who aren't trying to get huge amounts of fuel economy. "To make them drive nicely you have to leave them a little bit richer because they simply haven't got the load points to support being finely tuned to stoichiometric ratios. You haven't got [the] refinement in the on-board data logging or the load points that you have in more expensive aftermarket systems. "We've tuned all the cheaper engine management systems, and we find that for the money, we get the best results out of MicroTech." ChipTorque's head technician John Nash did the install. His first step was to very carefully sort out an appropriate wiring diagram for the car and another for the factory ECU pin-outs. In this case, he didn't have one specifically for the 180SX, so used an N14 Pulsar diagram. Getting as good a diagram as possible for the car being worked on is critical to success, he suggests. "Take your time; be patient," he adds. "Don't get flustered; don't be in a hurry to get it fitted so that you can run the car." 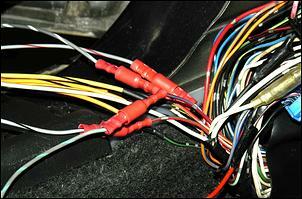 As is common on many modified imports, the factory ECU wiring loom had already been altered. In this case it appeared as if an interceptor had been fitted and then later removed (one additional to the F-CON!). The significance of this when fitting a new ECU piggy-back style is that the factory ECU will still be used to control idle speed and some other parameters - the new ECU controls fuel and ignition. If the standard ECU isn't working properly, a new aftermarket ECU won't make these aspects any better! So before starting the new job, check that there aren't any wires left cut and dangling from the previous work. 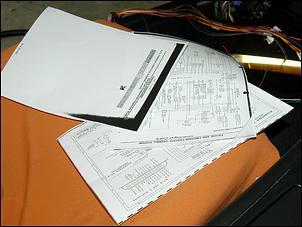 John photocopied the wiring diagrams so that he had three sheets at hand: the wiring diagram for the MicroTech, the wiring diagram for the 180SX (in this case the nearest diagram possible, anyway), and the pin-outs of the factory ECU. The first step was to wire in the four injectors. 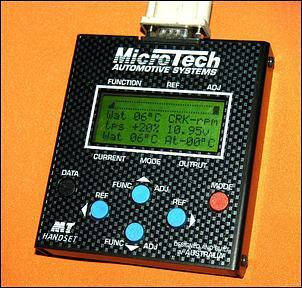 The MicroTech ECU provides a power and an ECU-switched ground for each injector. However, because the 180SX already supplies 12V to each injector (and also uses a switched ground to turn the injector on) only one wire from the MicroTech needed to be hooked up to each injector. Here John is checking the colour-coding of the injector wiring, confirming that the diagram he is working with is correct in this regard. The left-over 12V MicroTech injector feed was carefully labelled. 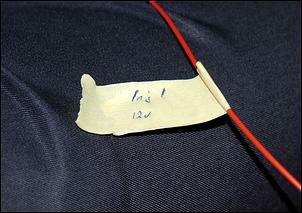 Any wires that will be left unused should be labelled as you go along. This avoids the possibility of later inadvertently selecting one and connecting it up! 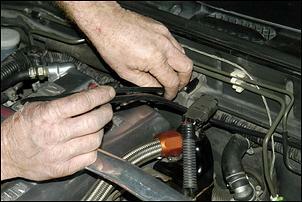 Note that when doing the wiring for the injectors, the firing order of the engine needs to be kept in mind. The MT-8 uses sequential injection, so the injectors need to be connected in the order in which they will fire. The injector feeds were connected to the 180SX wiring harness by cutting the original harness near to the factory ECU and then connecting (by means of stainless steel crimps) the injector feeds from the MicroTech. The MicroTech harness (which is long enough to extend to the injectors in the engine bay) was shortened so that the new ECU could be mounted close to the factory ECU without needing to have a long loom bundled away. "We would recommend that you make the connections by soldering," John said. "Or use a very good quality crimp - but they are not necessarily easy to get hold of. 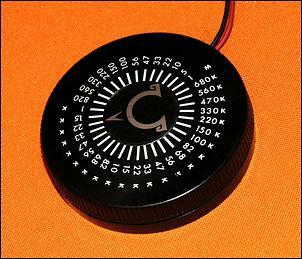 Soldering is probably the best option for the average person fitting it at home. Insulation is fine but the preferred option is heatshrink." The ignition connections were next. The 180SX uses direct fire ignition (ie one coil per plug) controlled by an ignition module. The not-quite-close-enough wiring diagram that was available for the car wasn't really clear in this area, so to make absolutely sure that the wire John was tapping into at the ECU-end of the loom was one of the wires reaching the ignition module, John did a continuity test using a multimeter. This is also an excellent approach to confirm that you are not making a simple mistake - eg working one pin across on the connector of the factory ECU. However, with the colour codes changing across the ignition module, and with the factory wiring diagram a little unclear, John took a common sense approach and made temporary connections for the ignition module feeds, using bullet connectors. The worst that could happen is that the engine would run very poorly (eg on only a few cylinders) in which case swapping the wires would then quickly give the right results. Once the correct wiring was ascertained, the connectors could be replaced with proper crimpings. Other connections that needed to be made included crank-angle sensor, engine coolant temp and throttle position. In general, for these connections John wired the MicroTech in parallel with the factory ECU. In other words, the coolant temp sensor was connected to both the MicroTech and factory ECU. This allows the tacho to work, the car to have correct idle speed control, etc. However, in operation the systems aren't always happy worked in this way, so in some cases the factory ECU may have to be disconnected. More on this in a moment. Rather than take main power and earth connections from the factory ECU, John ran new cables right to the battery. 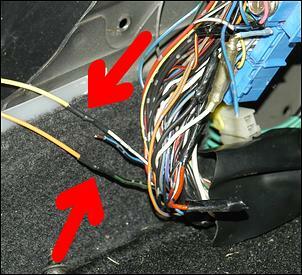 This avoids any voltage drop problems which may result in the car being hard to start. A blade-type fuse was mounted close to the positive terminal. 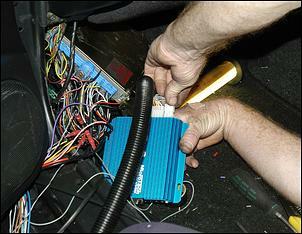 The ignition-switched power feed (which basically just wakes up the ECU) was taken from the original ECU loom. As with most aftermarket ECUs, the MicroTech uses an on-board MAP sensor. This is fed by a rubber hose running from the ECU to the plenum chamber. 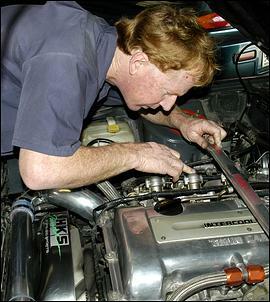 Here John is working the hose around the engine bay. The MicroTech has the facility to take an intake air temperature gauge, however the 180SX doesn't have such a sensor as standard. Interestingly, John used an adjustable resistance wheel to feed an input into this facility, so that the MicroTech was actually seeing a value. The installation (or otherwise) of a new intake air temp sensor was left to the tuner, Mathew Spry. 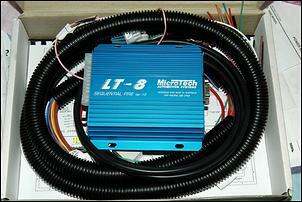 The new MicroTech ECU could then be plugged into its loom. Wiring the aftermarket ECU piggyback style in this way removes the need to run the new loom right into the engine bay (except for the power and earth). The existing loom, including the often hard to find plugs, are all used. The underbonnet view also looks near factory - one better step still is to find an aftermarket ECU that plugs straight into the factory loom. 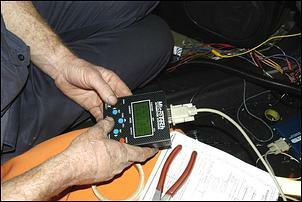 Such systems are available for commonly modified cars, especially those used in rallying. The next step is a vital one. Using the hand controller, and with the ignition switched on but the engine not cranked, John checked that the sensor data being displayed on the controller made sense. For example, here the water temp is showing just 6 degrees C - and it wasn't that cold in the workshop! The throttle position sensor (TPS) is at 20 per cent - but the throttle was closed. Each of these problems needed to be sorted before the car was started. In this case the coolant temp connection had to be configured so that it fed only the MicroTech, not both ECUs. The TPS had to have earth and +5V feeds from the MicroTech, rather than the minimalist signal wire connection initially made. John takes the view that it is better to start off with the minimum of wiring connections (consistent with the system operating well) and then make further changes as necessary. The MicroTech comes pre-programmed with base maps. 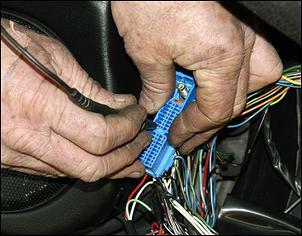 That means than when the wiring is correct, the key can be turned and the car started. In this case, the engine ran very rich in warm-up - so rich that it was staggering. 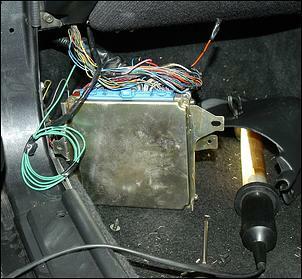 John initially suspected that his ignition module wires (the ones fitted with temporary bullet terminals to allow easy swapping) were incorrect, but in fact this was not the case. When leaned-out, the car warmed up fine. 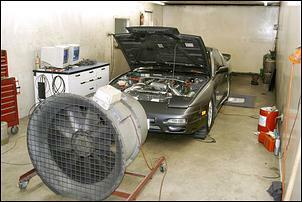 The 180SX could then go to the dyno room next door, ready for tuning. With boost pressure lifted to 18 psi and appropriate fuel and ignition strategies able to be put into place (the air/fuel ratio was richened from about 12.5:1 to 11.5:1 at peak power) the 180SX pumped out 204kW at the wheels, an increase of 7 per cent over the factory management. This compares with a previous peak of 190kW, however the maximum percentage increase occurred as the engine came onto boost. There the gain was as high as 14 per cent. The Microtech LT-8 ECU costs AUD$1095 and the fitting cost is $350 - $400. 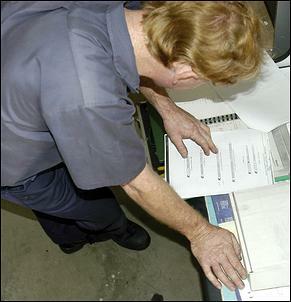 Tuning the system on the dyno costs a similar amount, giving a total bill of around AUD$2000.